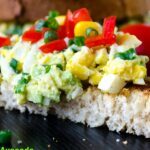 I’m here again with another avocado recipe! Did I tell you before how much we love this non-Turkish food? If you ask me my favorite two foods, I would most probably say egg and cheese. Now I’m combining these two with our new favorite food to make this super tasty Scrambled Eggs with Avocado. You might think that making scrambled eggs doesn’t even need a recipe as it’s one of the elementary level dishes. Everybody knows how to make it! You know what? I have some friends and students who can’t even make it. They are continually complaining about the recipes I share here, they find it above their level. That’s why I decided tell how I make scrambled eggs with a twist. Combining egg and cheese is not something new; everyone loves it, I know. What is new here, at least for our cuisine, is adding avocado in it. 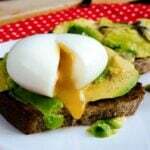 We know that avocado and egg go wonderful together from this Egg and Avocado Toast. I can proudly say that my Scrambled Eggs with Avocado has already become another winner at our weekend breakfasts! I hate overcooked eggs, I think it must be done in no more than 5 minutes. It tastes like rubber if it lasts far longer than this. When cooking the eggs, you shouldn’t leave the kitchen. Have your spatula in hand and interfere with the eggs when necessary. I didn’t use butter for these scrambled eggs, I wanted to feel that oily flavor of avocado instead. I made it with olive oil and it was definitely fantastic! Avocado is a great substitute for butter any time! 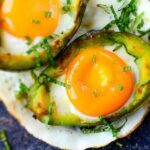 I love avocado raw, so I didn’t add it in the pan when the eggs are cooking. I just diced it and top the scrambled eggs with it as a final step right after it’s cooked. 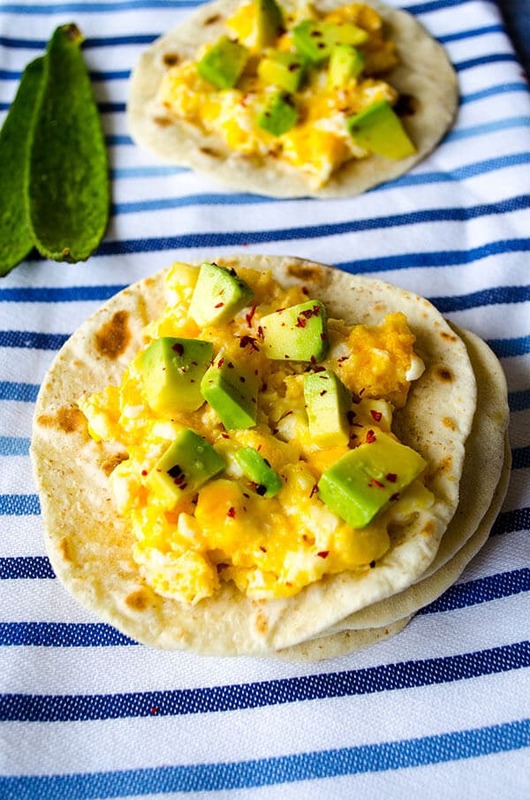 Another new thing in this recipe for our cuisine is serving Scrambed Eggs with Avocado on small Homemade Flour Tortillas. These breakfast tacos definitely make someone’s day! 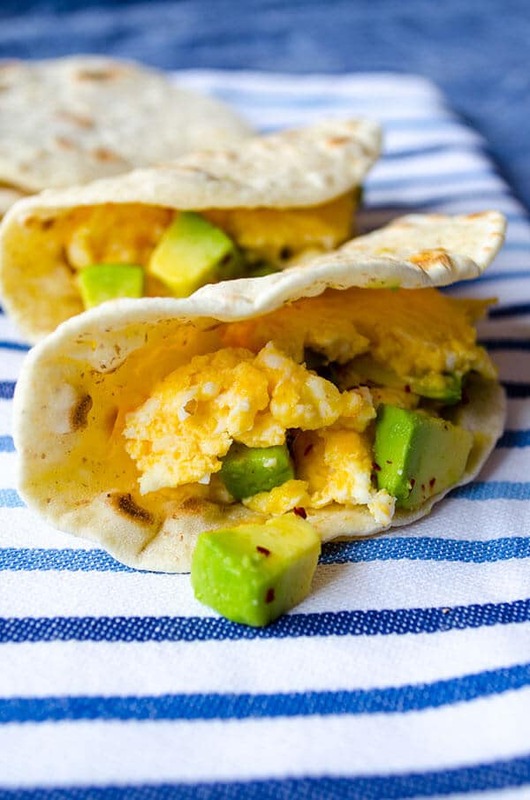 Scrambled eggs with feta topped with avocado. Serve on tortillas! Beat eggs in a bowl very well. The mixture should be evenly yellow. Heat a non stick pan and add olive oil in it. Toss in crumbled feta when the olive oil is hot enough and cook it for a minute. Pour the beaten egg evenly on feta and bring the heat to the lowest. Cook it for about 5 minutes. Make small holes with a spatula occasionally so that egg whites are cooked enough. 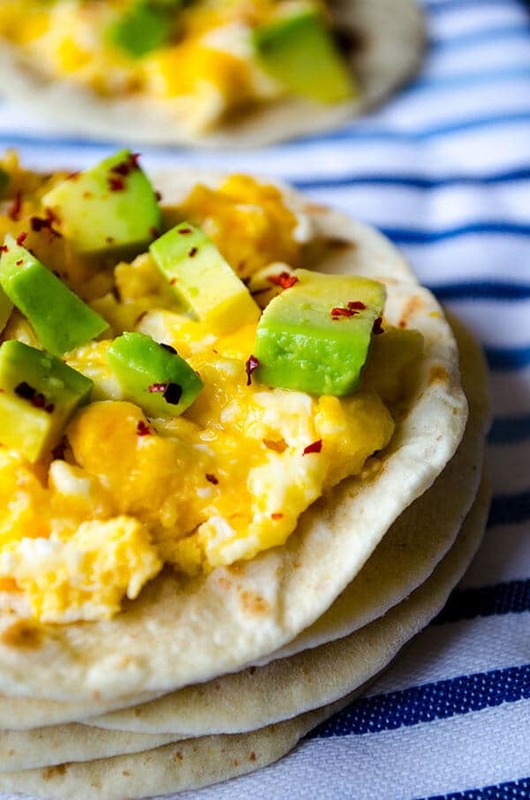 Toss diced avocado on it and serve on small tortillas or plates. I’m from Los Angeles and must say this looks like a real California-Mexican breakfast! If you used Mexican queso fresco (which, come to think of it, is a lot like Feta! ), this would be right at home in a taco truck.